What if we could measure human emotions the same way we measure a kilo of flour, the distance to the shops or the days’ temperature? A new children’s book attempts to answer this very question. In the book, Marcel Gramme is an engineer working at the Bureau of Weights and Measures—an amazing place where everything in the world is measured and assessed. When his young son returns home one day in a bad mood, he decides to invent a machine to measure exactly how happy, or unhappy, his son is. With impressive early results, he and his son set off on an invention spree as they attempt to measure everything from love to sadness to jealousy and beyond. Once they start letting other people use their invention, however, things start to go wrong! Suddenly, people can accurately measure if someone doesn’t like the present they’ve been given, and husbands can tell if their wives really love them! Chaos ensues. ‘A lot is said about the importance of encouraging our kids’ interest in science and maths, but there are hardly any books out there that show young kids just how much FUN it can be,’ says Andrew Wilkins, Director of Wilkins Farago. ‘Bureau of Weights and Measures is that rare book that combines learning and entertainment in a creative way. 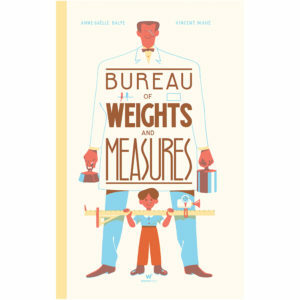 Bureau of Weights and Measures is written by renowned French author, Anne-Gaëlle Balpé. It tells the story of Marcel and his son as they invent a new machine to measure emotions. Ingenious, funny and thought-provoking, Balpé’s story is brought to life by Vincent Mahé’s distinctive retro illustrations that are full of the kind of details and visual jokes that kids love. The Bureau of Weights and Measures is a hardcover children’s picture book comprising 32 full-colour pages. It is ideal for early to mid primary school aged children. It is available for sale from book sales throughout Australia or online at www.wilkinsfarago.com.au. Teacher’s notes are also available online from the Wilkins Farago Website. Anne-Gaëlle Balpé was born in 1975 and lives in Romaineville, the Paris region of France. After studying Philosophy and multimedia (including Tibetain! ), she taught at University before becoming a school teacher. Balpé has written around 50 books for children, although Bureau of Weights and Measures is the first to be published in Australia. These days, Balpé devotes herself entirely to writing, to meeting her readers and to writing workshops. Vincent Mahé was born in Paris, France. He studied animation and worked as a set designer in the animation industry following graduation in 2008. During this time, he began to develop his own personal work and in 2012 took the plunge into freeland illustration and created a co-working studio with friends. 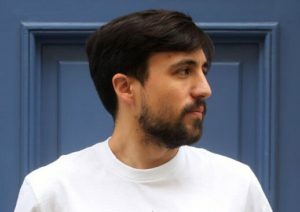 His work has been exhibited in Paris many times and features in The New York Times, Wall Street Journal, Wired, Nobrow and many more publications. For more information including requests for Author Q&As or interviews, please contact Helen Diggerson on 0414 376 924 or helen@wilkinsfarago.com.au.